This is a two part post, Part I is about the boat and how the boat works, Part II is about pay and how Royal Caribbean Limited makes money. This spring break, I got to go on a new type of trip: a cruise. 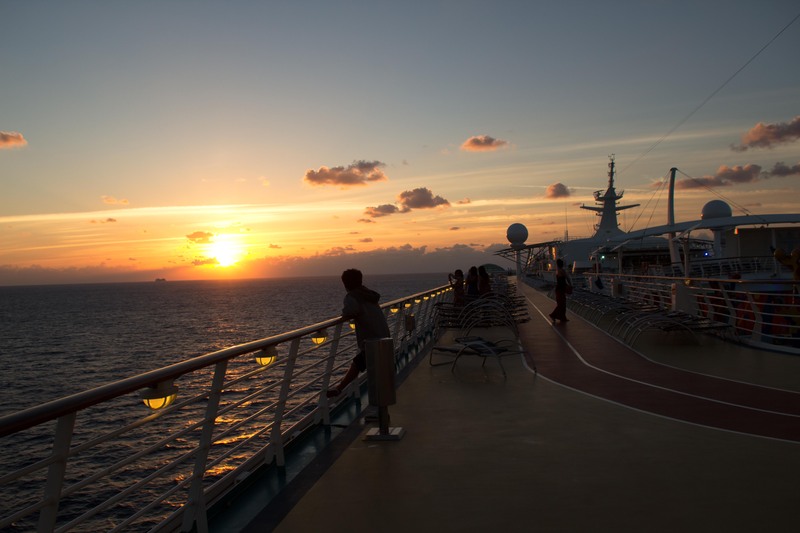 I had never been on a cruise ship before, and I was not sure whether I would like or hate the vacation. Since it was our first cruise, we decided to go on one of the largest ships in the world, The Liberty of the Seas. The Liberty of the Seas weighs 154,407 GT, is 1,111.9 ft long, and has 18 decks. It’s six engines give it a total of 110,000 horsepower to help it cruise at 21.6 Knots. The Liberty carries 3,634 passengers and 1,300 crew. Because it was spring break week, the boat was sold out. While I thought with this many passengers the ship would feel cramped, instead it was quite the opposite. The Liberty has 10 pools, 10 restaurants, 17 bars, 4 nightclubs, 14 floors, a shopping mall, a large theater, an ice skating rink, a movie theater, a surf simulator, a boxing ring (which I did not try), a full sized basketball court, minigolf coarse, climbing wall, arcade, and of course a casino (someone from the cruse if you’re reading this remind me if I forgot anything.) Unfortunately, I didn’t even get a chance to do a quarter of these things. On the vacation, I met a lot of very interesting people and had loads of fun. 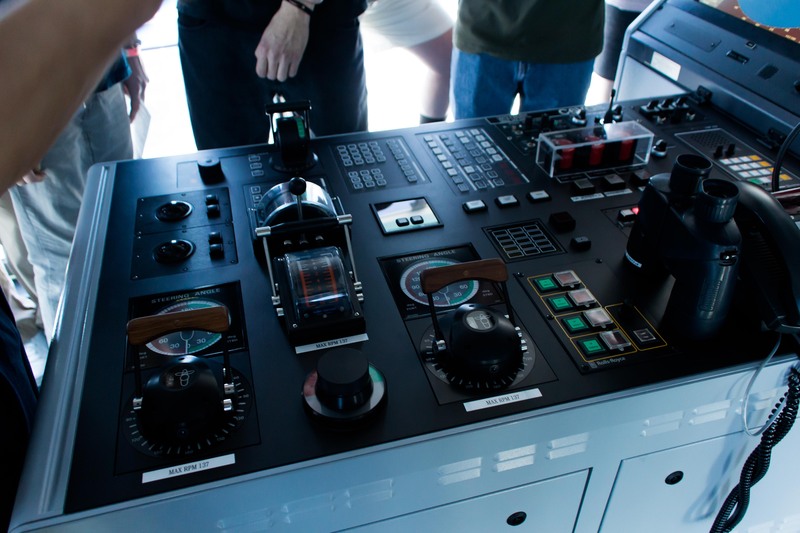 I even got a chance go on an “All Access Tour” and visit the bridge and engine control room. The Bridge, it reminds me a little of star trek. 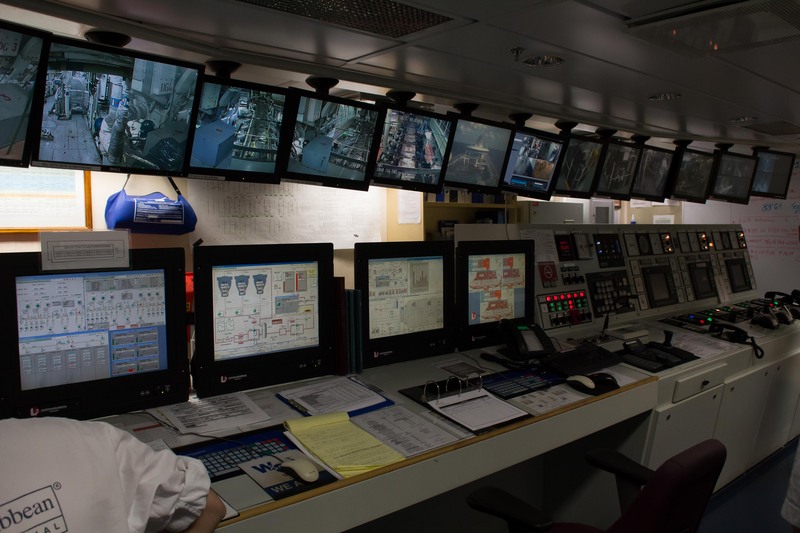 On this tour, I learned a few interesting things about how cruise ships are operated. While many people were warning me about going on a cruise after the Carnival Triumph “Poop Cruise,” I learned that most of the newer cruise ships have significantly more engine power than is needed to run the ship. As I mentioned earlier, all six engines on board produce a total of 110,000 horsepower, but most of that isn’t needed. The chief engineer explained to me that only five engines are needed for full speed, three for cruise speed, and one for power when docked. In fact, during the cruise, one engine was down for maintenance. He explained that they always keep the engines very clean and in perfect condition because if they have a more serious problem, it takes two months to remove one from the ship. Another interesting thing about this ship is how it is driven. Unlike most boats, the Liberty has no rudder. This is because of a system of three “Aquapods” that turn with the propellers. This type of Propulsion enables the ship to drive in literally 360 degrees. Since the boat can be driven in all directions, it isn’t steered with a wheel. 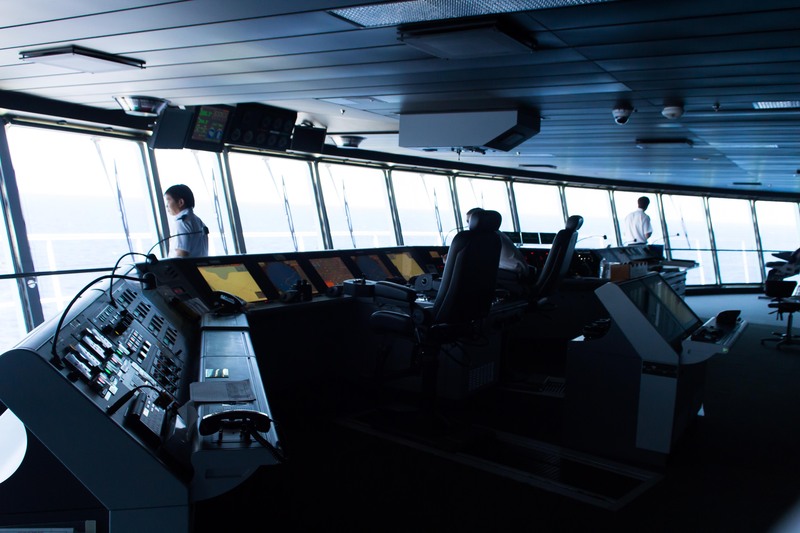 Instead, the boat is controlled by three “Gyro-controllers” which have power levers and are able to be turned in any direction. For instance, if the Captain wants to stop the boat immediately, he can turn all the Aquapods backwards and put them on full power, making the boat go from full speed to a complete stop in 4 minutes and 23 seconds (Less than one nautical mile). Other than how the boat is driven, I also learned about logistics and how food is stored on the boat. All of the food is ordered two weeks prior to the cruise, depending not only on the number of passengers, but also the type. For instance, our cruise had over 1,000 passengers under the age of 18. Apparently, passengers under 18 like to eat more hamburgers than they do Brussels sprouts, so he would order accordingly. The goal is to have the least amount of food left over at the end of the cruise without running out, a lot harder than it sounds. 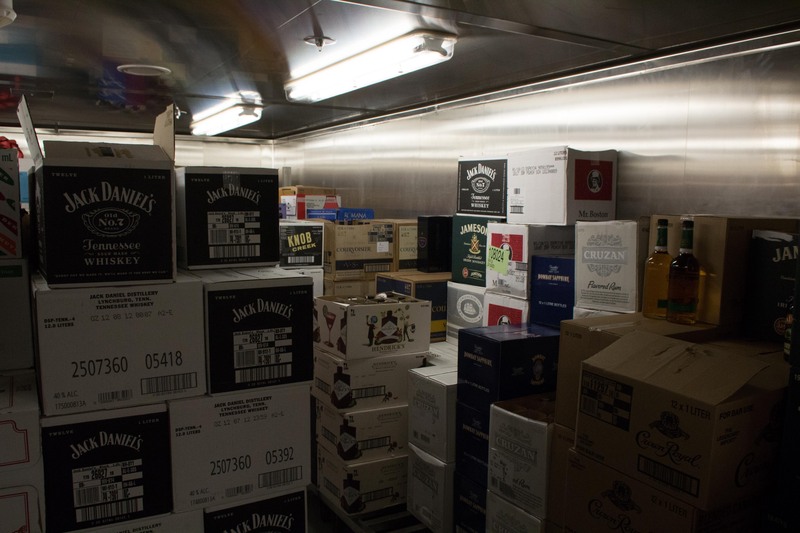 The Liquor Storage Area, with over $65,000 in alcoholic beverages, complete with a fireproof door. At the beginning of the cruise, the ship carries a total of about $1.5 million in food, which gradually gets consumed by the end of the cruise. They cook about 18,000 meals per day, or 90,000 by the end of the cruise. This is just a small snippet of the 3.5 hour tour of the ship that I went on. If you have any questions about the kitchen, theater, docking, storage, laundry, the bridge, or engine control, please comment. Anyone that has been on a cruise probably wonders how cruise companies make money. On a boat that costs $800,000,000 with unlimited free food and amenities, it is a great question to ask. There are many answers, and the first lies in how employees are paid. If you ever go on a cruise, you will notice that many of the people that work on the cruise are from poor third world countries. After speaking to many of them, their pay works sort of like this: they work for seven months straight, (thhey don’t get weekends off, although they can get off the ship for part of a day once a week), they then get one month off, and they start the seven month cycle again. How much do they get paid for those seven months? About $800. Yes, $800, which equates to about $4.00 a day. Remember that when you are on a cruise ship, you are under maritime law, not the United States. That means there is no minimum wage. While this doesn’t sound too great, and the crew definitely works hard, this isn’t as bad as it sounds. The crew on a cruise ship does not have to pay any taxes, they get free medical, free food, free room and board. They also get tips. Most of the crew that work on the ship are able to send 100% of the money they make home, where $4.00 a day puts you in the middle class. For Royal Caribbean, the price of the room pays the bills, and the money that they make selling merchandise, drinks and excursions is pure profit. Because passengers are confined for multiple days in a space that is wholly owned by the cruise line, they have a monopoly over you, and can sell you stuff with no competition at whatever price they desire. While I understood this would be the case on the cruise ship, I was surprised to see it in port. On the upper right, the clear division between the RCL owned port and the real Falmouth. 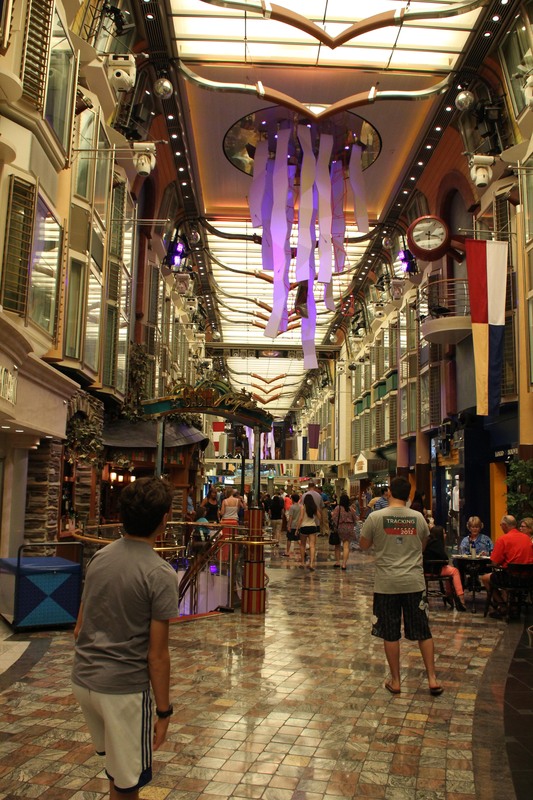 The way that the ports are operated is another large income source for Royal Caribbean. 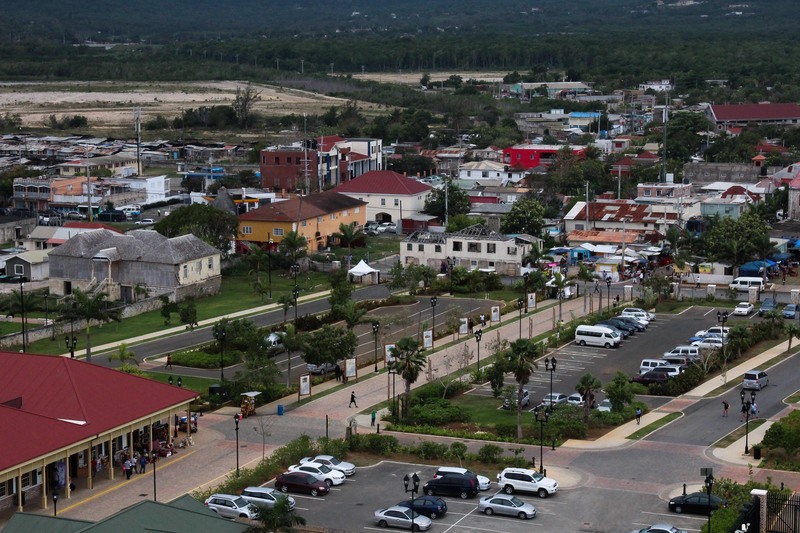 At the only port we went to with access to the mainland (you could not leave Labadee), in Falmouth, Jamaica, there was a rather tacky “town square” with shops and restaurants near the boat. 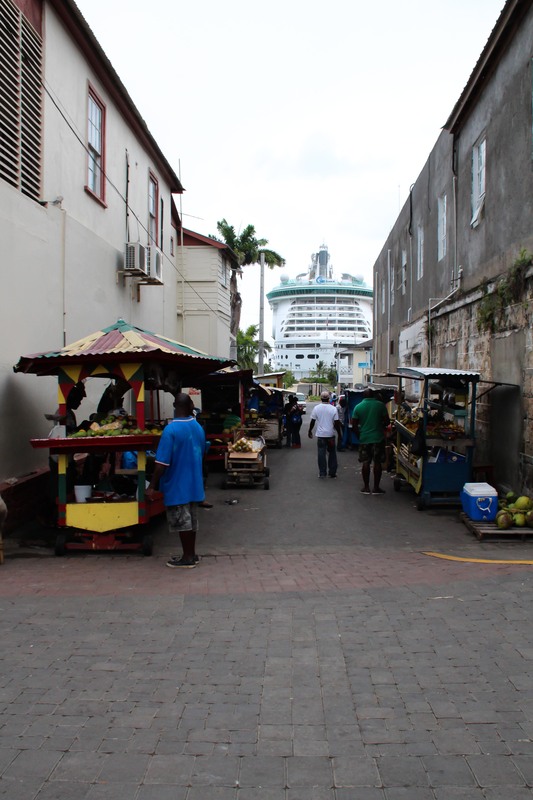 If you walk out of this area there is a gate with security separating the actual town of Falmouth from the fake one created by the cruise line. This is shown in the photo above. The way that this works is that every person in the fake town pays rent and a commission on sales to Royal Caribbean. 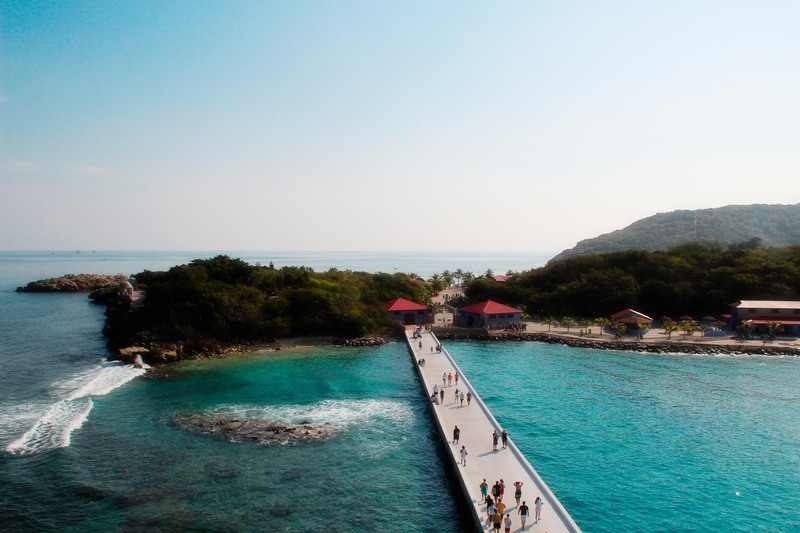 Royal Caribbean highly encourages people to shop within this area, providing people maps, water, nice restrooms, and in general keeping the area very clean. The minute I stepped out of the fake town, and into the real Falmouth, about 25 people hounded me trying to sell me stuff. The cruise ship companies also make a lot of money off of selling excursions. Originally we had booked a tour of Jamaica, for about $100 per person, but fortunately, we ended up canceling. When we walked in to Falmouth, we were able to get a private, personalized tour for as long as we wanted for $120 (+ $30 tip we added). The company that the tour guide worked for ended up being the exact same company as the one that the ship hires to do the tours, except we paid 25% of the price. That other 75%? All profit. The final two ways in which cruise companies make most of their profit is from drinks and the casino. On our cruise, only three drinks were free: water, lemonade, and iced tea. If you wanted to drink anything else you can purchase a soft drink package ($7 a day) or one of the alcohol packages (about $55 a day.) Lucky for me, my favorite drink is water and i’m under 21, so I purchased neither. If you didn’t have the drink package, you could still buy drinks a la carte on the expensive side at $6 for a virgin piña colada, phew. The on board casino also provides a fair amount of money for the cruise line, with a lower return than Vegas. They actually had a sign at the front of the casino showing how much money people won and how much RCL made, and by the end of the cruise they had made a few million dollars. If this article about how cruise ships make money is discouraging you from going on a cruise, don’t let it, it’s not that much different than the airlines charging you to check a bag. I had an awesome time on the cruise and I would encourage anyone to go on a Royal Caribbean cruise (especially the Liberty of the Seas) in the future. Now I will leave you with a video I took of the ship departing Falmouth, Jamaica. The only thing you missed were the secret rooms (screening room) and the Heli-pad.